By now, Mobile Learning has a more than ten-year long tradition within the field of educational practice. However, how teaching and learning with mobile technologies is realised diverges greatly. 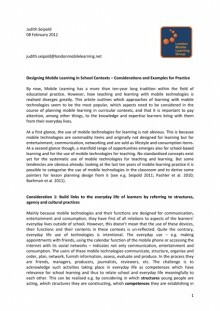 This article outlines which approaches of learning with mobile technologies seem to be the most popular, which aspects need to be considered in the course of planning mobile learning in curricular contexts, and that it is important to pay attention, among other things, to the knowledge and expertise learners bring with them from their everyday lives. At a first glance, the use of mobile technologies for learning is not obvious. This is because mobile technologies are commodity items and originally not designed for learning but for entertainment, communication, networking and are sold as lifestyle and consumption items. At a second glance though, a manifold range of opportunities emerges also for school-based learning and for the use of mobile technologies for teaching. No standardised concepts exist yet for the systematic use of mobile technologies for teaching and learning. But some tendencies are obvious already: looking at the last ten years of mobile learning practice it is possible to categorise the use of mobile technologies in the classroom and to derive some pointers for lesson planning design from it (see e.g. Seipold 2011; Pachler et al. 2010; Bachmair et al. 2011). Structures are for example structures of mass communication and everyday-life, e.g. learning environment, home, school, peers, leisure time. Learners navigate within these structures and use them but they also produce structures, which is an important and emancipating aspect. Orientating oneself is as important as is to provide orientation. Agency means the ability to act in the world with all available structures and to appropriate these structures. Part of this is that each individual has a subjective perspective on the world. This indicates that agency is affected by subjectivity and that – as a consequence – appropriation and learning are first of all and always subjectively meaningful. The aim is for school learning to moderate between subjective perspectives of the learner and objective requirements of school. In some areas young people develop routines (so-called “cultural practices”). These routines enable young people to act confidently and safely in situations and within structures. Here it becomes necessary to acknowledge e.g. the organisation of everyday life, networking, media reception and production or investigation competences of the learners in relation to curricular requirements and to make them available for school learning. The terms and concepts of structures, agency and cultural practices evidence the fact that engagement in media activity is an intentional activity, which is also dependent on the social and cultural situation of media use. These aspects are important for teaching because they help to consider that learners from different social milieus have different availability of technologies, attitudes towards learning, availability of information etc. What can mobile learning look like in practice? Mobile learning practices are potentially manifold and creative – even if there are also challenges such as the high cost of devices, difficulties in purchasing mobile devices, compatibility of devices, expensive internet connections, focus of learners on the devices rather than on the curricular content and so on. Top-down approach: often mobile devices are implemented into learning contexts from top to bottom which means they are set-up in relation to already existing teaching and learning structures. This happens often within big projects that have large budgets (see e.g. example 1). In such projects, whole grades, years or even schools are provided with mobile devices such as PDAs. A benefit of this approach is that learners who are structurally disadvantaged are not excluded because all learners own the same devices through which equal opportunities are ensured. Risks extend especially to two aspects: first, it may be possible that technologies now have to be used in situations that didn’t require the use of technologies before and that learners and teachers need to adjust their teaching and learning process to the requirements of technology and infrastructure. This can result in excessive demands. Second: because tools from everyday life can now be used in school contexts, conflicts might arise; this could happen because learners often are not allowed to use the mobile devices the way they are used to using them in their everyday lives and how the use corresponds to their patterns of use or usage preferences, their agency and their cultural practices. Bottom-up approach: the bottom-up approach takes account of available resources such as devices and knowhow of learners and teachers. This is cost-saving because no devices have to be supplied. Besides, learners are confident with their devices and can revert to their routines, competences and knowledge when using them. Such projects benefit also from a range of resources originating from the everyday life of learners. If they get the opportunity to work in a self-directed manner when using mobile technologies, contents and other resources supporting their creativity, learners often build exciting connections between school and everyday life (see e.g. example 2) – and at the same time the outcomes are still re-usable and assessable in school categories. However, one needs to take into consideration that some learners don’t own mobile devices, or that they have only old models at their disposal which don’t have all the features that new devices boast. In this case learning groups can be recommended. The cost question still exists in relation to the internet or connection cost. And finally, the diversity of devices and models can be a challenge, which, on the other hand, can be considered in advance when planning carefully. Affordance approach: the demand-orientated use of mobile technologies is certainly the use pattern that is closest to the everyday use of mobile technologies because the devices are used only when users consider them necessary/helpful or when teachers apply them selectively and explicitly as teaching and learning tools. Mobile use within this scenario is often related to the use of Interactive Whiteboards or platform solutions such as Moodle or Mahara (see e.g. example 3). Such arrangements are often very complex, and in order to guarantee the “seamless” use of these technologies in class it is necessary to guarantee stable and sustainable infrastructures – which are accessible for learners also from outside school (e.g. from home or on the go). But apart from that, the affordance strategy allows for the opening of the school to media use in everyday life as appropriate and to design lessons by referring to instructional or communicative and discursive learning – alone or in groups. Also, it provides the opportunity to choose learning materials and content provided by school or to refer to resources from everyday life etc. Parameter A names the teaching setting (didactic setting), learning spaces and social form of learning and ranges between the practices of school and everyday life. Parameter B points to the relationship that the learner has to the object of learning and covers the range between mimetic reproduction and personal reconstruction. Parameter C covers the learners’ individual expertise and covers the area between the pole of school curriculum and personal expertise. Parameter D refers to the span between different modes of representation such as written text in a book and moving images in films. Here, we have the two poles discrete (i.e. mono media, mono modal) and convergent (i.e. e.g. mobile and web 2.0 technologies). This approach mainly attempts to help to acknowledge learners‘ media use, content preferences, styles, expertise, competences, knowledge etc. which they bring to school from their everyday lives and to provide spaces and places to use these resources for learning in the classroom e.g. by bringing together formal and informal aspects. Bachmair, B.; Pachler, N.; Cook, J.: Parameters and focal points for planning and evaluation of mobile learning. 2011. URL: http://www.londonmobilelearning.net/downloads/Parameter_flyer.pdf. Brodersen, C.; Christensen, B. G.; Grønbæk, K.; Dindler, C.; Sundararajah, B. : eBag. A Ubiquitous Web Infrastructure for Nomadic Learning. In: Association for Computing Machinery, Inc (ACM) (Hrsg. ): Proceedings of the Fourteenth International World Wide Web Conference, Makuhari Messe, Chiba, Japan, May 10 – 14. ACM Press, New York 2005, S. 298 – 306. Deubelbeiss, R.: Beispiel-Sammlung Projekt „Handy“. 2007. – http://metaportfolio-phsg.kaywa.ch. Faux, F.; McFarlane, A.; Roche, N.; Facer, K.: Handhelds: Learning with handheld technologies: Futurelab Handbook. Futurelab, Bristol 2006. Pachler, N.; Bachmair, B.; Cook, J.: Mobile learning: structures, agency, practices. Unter Mitarbeit von Gunther Kress, Judith Seipold, Elisabetta Adami und Klaus Rummler, Springer, New York 2010. Seipold, J.: Mobiles Lernen. Theorien, Unterrichtspraxis und Analysemodelle der britischen und deutschsprachigen Mobile Learning-Diskussion. Dissertation zur Erlangung des akademischen Grades eines Doktors der Philosophie (Dr. phil.). Submitted April 2011.